My 4 year old would live this soup! That is weird. I just made your broccoli and cheese soup saturday. so delish but I will give this a a try. thanks! that is so funny! I’m glad you liked it – that is an AWESOME recipe, glad you liked it! let me know if you like this one, too! This recipe looks great! I love soup when it is cold outside so I’m going to try this this weekend! Oh, I’d love this, thanks! I’ve been looking for some homemade soup recipes since I’ve ditched canned soup as part of my transition to Mindful Living. This looks great! I love the Fresh 20 and have been contemplating getting the book. I’ve heard great reviews from friends. My sister loves broccoli cheese soup. I will try to make it later. 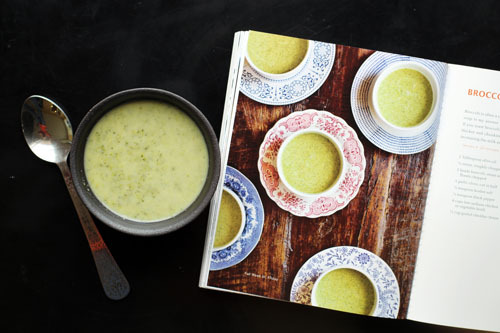 I love the idea of a cookbook that follows the season. Awesome! I am also intrigued by their subscription meal idea. I’ve heard great things about the Fresh 20! It is rainy and yucky here today, so soup would be perfect for dinner! Thanks for the recipe and giveaway! The book looks great! Can’t wait to win it! Books looks great and the recipe looks yummy!!! 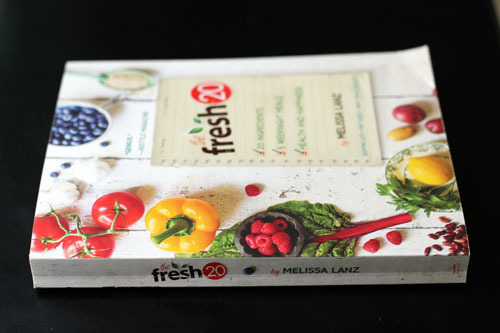 I have been wanting a subscription to Fresh 20, this would be awesome! I made broccoli cheddar soup this week too! I love cheddar broccoli soup of all varieties. 🙂 Full fat ones are good for days you feel skinny. Definitely going to try this recipe! My 5 y.o. will eat just about any soup. Must try this recipe! It’s soup season. this looks super yum! Thx for sharing. I will be making soon. I could use some healthy recipes! I love broccoli cheese soup. It has started to get cool here in Texas. I love it when healthified recipes taste as good as classics, last week I made a reduced fat carrot cake with oil and carrot baby food–it was incredible! 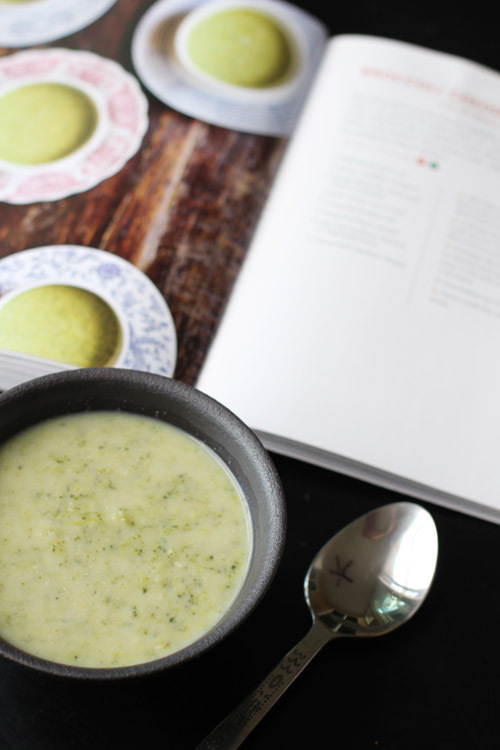 Broccoli soup is one of my families favorites! What a great giveaway! The meal subscription sounds like it could breath new life into my menu planning. I love this healthy alternative!!! I wonder if MY Owen would like this soup as much as your Owen. The soup looks delicious! I definitely want to check out this cookbook as I am determined to simplify my menu plans. looks amazing and so warm on a wintery blowing kansas day like today! my husband loves broccoli cheddar soup, I will have to give this a try. I LOVE Broccoli Cheddar Soup! It’s one of my all time favorites! Looks good!! Sounds great – love soups!! This is a great giveaway, just what I need to kick start some healthier habits. And finally got hip to following you on your social channels! I’ll have to try this recipe. Thanks! This looks like exactly the kind of cookbook I can get behind. Fingers crossed! Facebook giving me another go! And one more for Twitter. Here’s hoping! Broccoli cheddar soup is a favorite of mine. The Fresh 20 sounds great! This is a great giveaway! Thank you and fingers crossed. I love cookbooks! And broccoli cheddar soup is one of my favorites. I can’t wait to make this! 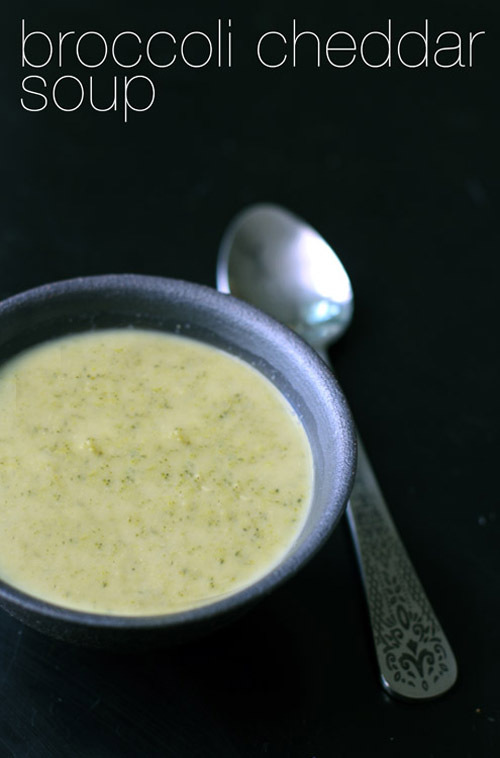 Can’t beat a good broccoli cheese soup! …and I follow you on Pinterest. …and I like you on Facebook! The soup looks delicious! I hope I win! I love Broccoli Cheddar soup and cooking with the seasons! Can’t wait to try the recipe! Thanks for posting! what a great cookbook. this soup sounds so good! That cookbook looks so lovely! Will be making this soup today! This looks great. Can’t wait to win! Feel free to follow me back on Pinterest. This soup looks yummy! I may have to make this tonight! This just sounds like my kind of cookbook! Yum! So many give aways Jane! I love it! This is an uncommon soup that i have never seen before. But it’s looks so good. I will keeo trying to make this soup. Have you tried freezing this soup? I just wonder how well it will thaw and reheat. Hi Tina! I personally have not, but since it’s broth-based I really think you’d have no trouble. Let me know how it goes! I haven’t tried freezing it yet but I did make a batch on Sunday and we all loved it. My 8 year old son ate three bowls. I plan to make more this week and hopefully try freezing it this time. Thanks for sharing such a great recipe!